And so the sun has started to set on our adventurous road trip this summer. On Tuesday we went out to Uncle D’s house and had a very good dinner and some of his homemade wine! By Thursday we were packing up the truck with our haul because mom and pop were leaving for home on Friday. We played around a bit though too. Then Longboarder wanted a ride. It didn't quite work out. So Longboarder gave First born a ride instead. But then it was time to load up the truck. Amazingly we fit almost everything. Only things that didn’t make it in were 2 coffee tables and a chair that Grandma claimed. Not sure we will get that one back. Mom and pop said they will be going back to Cheyenne in September so they can bring back the stuff that didn’t make it this time. The poor truck when everything was packed in was a bit back heavy and slightly lopsided. It made it back to California though with no problems. Frontier Days had started so First born and I went downtown to the park to try and get in to see Young Cowgirl in the Junior Barrel Races. We got all the way to the arena before we got turned away. We saw it on Cousin Sweety truck driver’s phone. She placed 3rd! 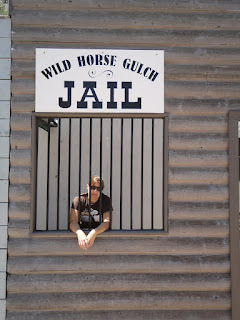 After being turned away, First born and I walked around the booths and shops and went down Wild Horse Gulch. 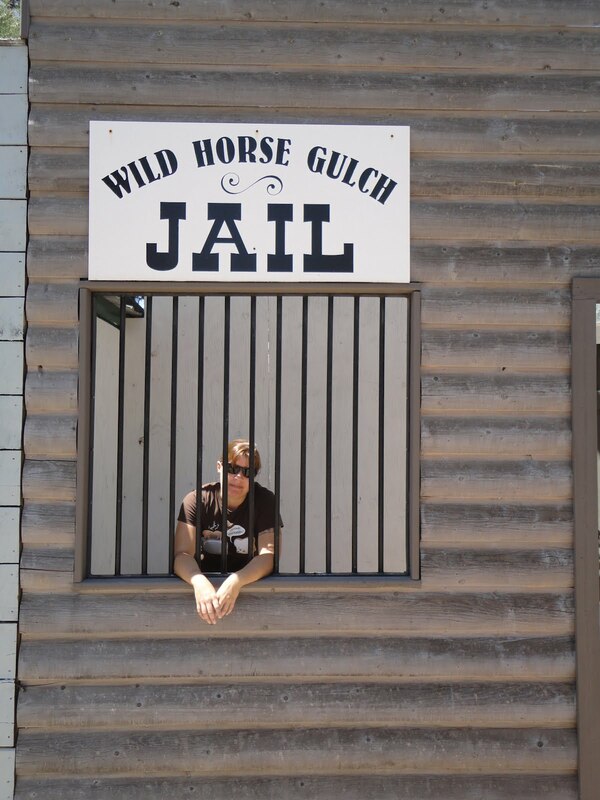 I got put in jail. I swear it wasn’t me. It’s a conspiracy! We watched the pee-wee stampede. Hilarious! Went over to the Indian Village and got fry bread. Yummy! And then went back to Grandma’s. Saturday was spent just lolly-gagging around and playing games with Grandma. She may be 90, but she still wins almost every time! Gosh darn her! It was time to leave on Sunday. We said our tearful goodbye to Grandma and saw her off to church, and then we headed down to Denver Colorado to pick up Miss my car and Longboarder who were visiting their dad over the weekend. We stuffed the car, quite literally. The guy in the starbucks parking lot in Denver was quite impressed. We headed out west on I-70 through Colorado and Utah. First born drove the day shift this time and I tried to sleep. We got to see a tornado in Utah. But don't worry we were far away. I didn’t sleep much at all, so I watched a 4 hour BBC mini series called North & South (not about the civil war). I took over driving duties at the Nevada Utah border. I only made it to Reno before I was starting to fall asleep. I woke First born up and asked her to drive us to Sacramento California, and then I would take over again. She ended up driving the rest of the way home. When we pulled into the driveway, we all couldn’t wait to get out of that darned car. It really was like being packed into a plane this time. Within 30 minutes of our arrival back home, Longboarder had unpacked, showered, and was out the door on his board. Pop showed up with the truck to unload, and mom showed up in the car to bring back her stuff we had loaded into the truck. Miss my car left with mom to the DMV because he had lost his license and wanted desperately to pick up his car and drive it. It didn’t matter that he had just spent 20 hours in a car. We were zombies that day. But we all kept moving and doing stuff. We ate dinner at mom and pops, nothing special, but it was delicious. But that may have been the zombies talking. I slept like a rock that night. I woke up the next morning and don’t think I moved a centimeter in my sleep. It was super easy making my bed that morning. The trip was great. Seeing family I hadn’t seen in decades was awesome. So glad I did my side trip to Chicago to see my internet besties, and the trip to Minnesota to see my childhood bestie as well. But I am so glad to be home. I will leave you with this picture of the windmill behind Grandma's bunkhouse. So like I said earlier, almost everyone had left again and left those of us still here with a mountain of laundry. So today, (Monday) which is usually the wash day, right? We decided to do it the old fashion way! 1960's style! First born and I remember helping Grandma with the laundry back in the day. She was adamant for us to stay away from the ringer! "You can lose an arm", she would say. We had asked Grandma months ago if she would let us have her old ringer washer. We want to use it in the store. She said sure, and that she actually has two. So we asked her neighbor who had her spare, if we could have that one too. She said, "of course, by all means"! So we pulled Grandma's up from her basement and crossed the pasture to her neighbors and pulled that one out of her basement. And we all stood around them and wondered, "Do they still work?" We just had to find out. We cleaned them up, filled them with water, and turned them on! By golly, they just don't make them like they used too. Of course Grandma still had some blueing left. You put some blueing into the second rinse bin and it makes your whites brighter. Who knew? She also had to give us the lesson of not losing your arm in the ringer. Grandma giving us our lesson before we begin. "Now pay attention!" First born was delighted to finally get to use the ringer! She was practically giddy with excitement. Hey, that's my underwear! Why is Grandma so happy about my underwear? Even Longboarder got in on the action! We washed about 7 loads of laundry in about 2 hours. The agitators are better, cycles are faster, and uses less water. Bloody brilliant! (actually, no blood was spilt) We got everything on the line, and then decided we deserved a treat and took pop to the Sierra Trading Post. He got two belts, I got a $5.00 pair of jeans, and First born got a $3.00 backpack (saved 97%) and $7.00 pair of jeans. We made out like bandits! But it also started to rain... and hail... and rain... and hail. Hope they got the laundry in! We got back and Grandma, Aunt P, mom, Longboarder, and Miss my car were soaked. They rescued the laundry, but paid the price of soggy shoes, wet denim, and tight curls (Grandma's perm). By the time the rain stopped, Grandma almost had an island in her driveway! So of course we had to get in it! All in all, a wonderful day, and no one lost an arm! Hurray! And so it begins. I came back from my mini (ultimate) road trip to find that my brother (Unfortunate middle child) and his boys Always Right and Chatterbox had beat me back to Cheyenne and had already moved into the camper trailer in Aunt P’s driveway. My parents (mom and pop) and First born’s oldest son (Miss my car) had also arrived. Pop’s clan had all arrived. Does everyone have their life preservers on? We went down to Wellington Colorado again to Aunt J’s house to swim. We were soon laughing it up with Cousin Crazy (Aunt J’s youngest son) and his wife and daughter. His eldest couldn’t get out of work to make it. Later that evening we all went out to Cousin B’s place for dinner and horse rides. Chatterbox fell into his element learning to rope and ride. We ate tons of food, and watched Cousin B’s daughter (young cowgirl) demonstrate barrel racing. Everyone got a horse ride, even the ones who were scared. Cousin Crazy's lovely wife... she really is! And gosh darn it, she rode that horse! Aunt P rides with style! It was time for Grandma’s 90th birthday celebration. Granted her actual birthday was in May, but I think we have all decided to celebrate all year long. All of Grandma’s 5 children were in attendance, plus all of us cousins. It was the first time all of us had been together at one time since 1994! All nine of us! And all but one of the greats (14). We celebrated the big event at the Terry Bison Ranch. We ate buffalo burgers, sang songs, told stories, and listened to Grandma play her accordion. First born and I later got her accordion out, and Grandma tried to teach us to play. That thing is hard! It’s exhausting, don’t know how she can do it. We saw llama’s, camels, a really fat tom turkey, and alpaca’s at a bison ranch, who knew? This llama was really hungry. Grandma arrives back home in style. The next day the majority of us went out to Grandma’s house and just had fun. Playing hackie sack, airsoft guns, bow and arrow, and always chatting and laughing. If this family does one thing right, it’s laughing our asses off. *wrote most of this waiting for Miss my car in Starbucks. He needed wifi like his life depended on it. And once again I am stuck waiting for Miss My Car, only this time he is taking a 40 minute shower. He has no hair! What is he... nevermind, don’t answer that. Stay tuned for the next adventure involves dirty socks and is a real hum-ringer! HA, I crack myself up sometimes. Hello Wisconsin!! The driving continues. Left Naperville Illinois around noon on Monday. It was suppose to take about 8 hours to get to Winsted Minnesota. I did it in about 9. I rolled up to the house of toys and chaos around 9pm. I went to Minnesota to see CB (my Childhood Best friend). She has five adorable kids (big brother is 9, muscle man is 6, twins are 4, and little surprise is 3). I understood that being a single mom was difficult, but I now have a new admiration for you ladies. CB, you amaze me! Your kids are happy, healthy, extremely intelligent, funny, and loved, and it shows! So they are a bit loud (I’m being sarcastic) and crazy, but who cares. Tuesday we all went to muscle man’s T-Ball practice and then headed to the Arboretum. Beautiful place!! At the last bathroom break, big brother, muscle man, and I went to look at the large map of the arboretum and the others didn’t know where we went when they all finished peeing. 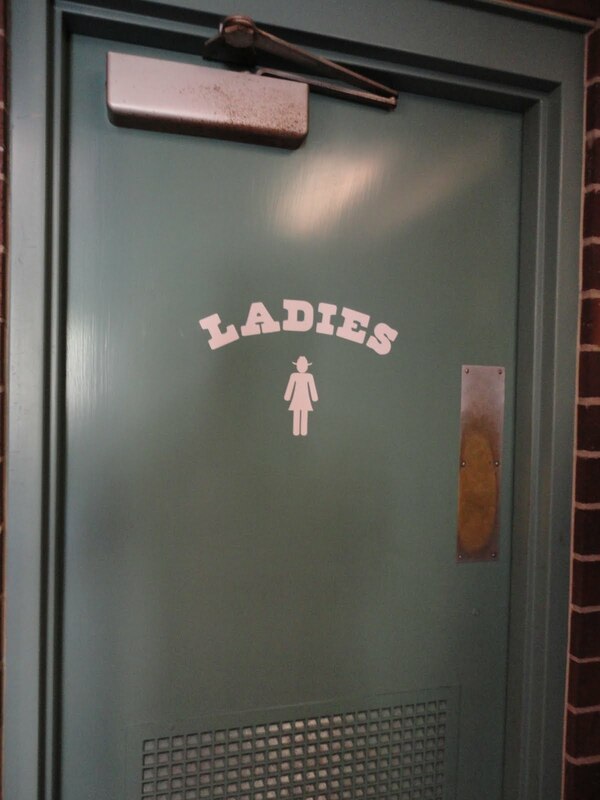 After waiting around for a while, thinking they were still in the restrooms, we soon realized they were nowhere in sight. Oops. Everyone else eventually went to the minivan of love and started driving around looking for us. Obviously we met up again and there was much rejoicing. Later that evening we all went to big brother’s baseball game. I have no idea which team won. Wednesday morning we got back into the minivan of love and drove to Darwin Minnesota. 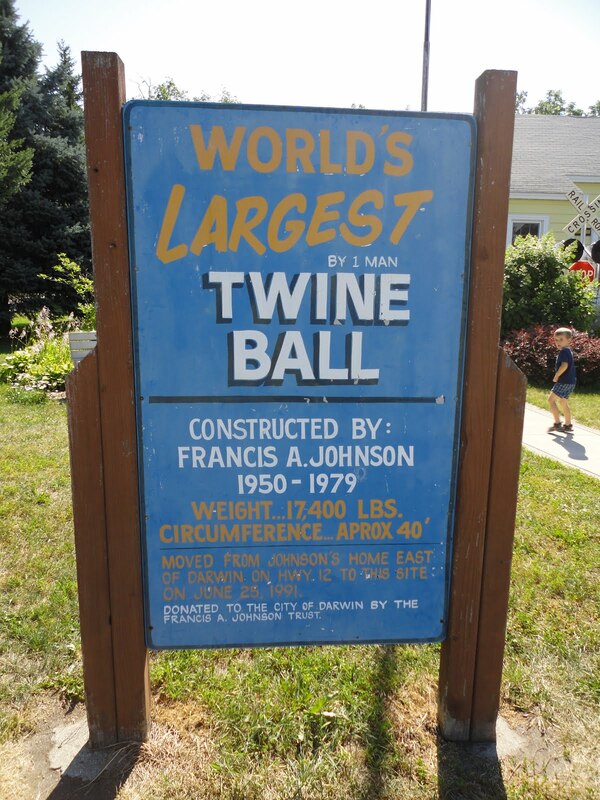 All to see the largest ball of twine. That’s right, I told you in the last blog I was going to see it and I did! Here’s proof. Crossed the Missouri River and watched the sun set over Nebraska. I also happened to be driving right into the lightning storm. I was tired by 10pm and needed to stop for the night. There were no good hotels. I finally found a Holiday Inn but the room rate was exorbitant! They recommended across the street. They had a room, half the price of Holiday Inn. And now I know why. Gross. Didn’t see any dead things, but that building just needs to be demolished. I charged the phone since Minnesota sucked the battery dry, charged the laptop, showered, and slept for about 3 hours. I had had enough. Was back on the road by 5 am. So I also watched the sun rise over Nebraska. I loved visiting the Internet Besties and CB and her kids. 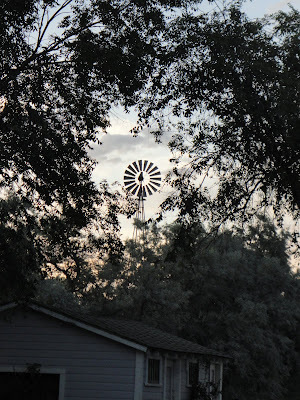 Everywhere I went was beautiful... in it’s own way, but I am happy to be back in Cheyenne Wyoming. It is now a decent hour of the morning to drop off my crap at Aunt P’s house and return the rental car. So my adventure at Starbucks this morning can end. Time to hang out with the relatives!! One more thing. Actually two. Total mini trip miles driven is 2,232. 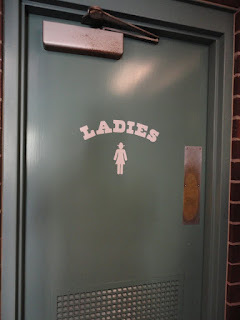 And you know you are back in Wyoming when the ladies room emblem has a cowboy hat. After First-born, Longboarder, and I slept and ate and slept some more, we were once again functional human beings. We lounged about at Grandma’s. Lounged about at Aunt P’s. We drove around looking for thrift shops and bored poor Longboarder to death. And went down to Wellington Colorado for their July 4th festivities and saw the largest mule EVER!! I picked up a rental car and headed out on the next installment of the road trip on Thursday. I drove 15 hours to Naperville Illinois to see my internet besties, Evil, Noir, and Trek (as in Trekie). Why do you hate me, Nebraska? It seemed like the entire state of Nebraska is under road construction. Seriously, even 10 miles was yet another construction zone. Took forever to get out of that state! Typical view of Nebraska: Corn! Iowa was pretty, at least the first 90 miles. The other 200 miles, I have no idea. The sun set over Iowa. It was a blood moon (red), but then three hours later it was white. Iowa reminds me of Denmark. I can see why all the Dane expats came here! They are still here. If I remember my family history right, my Danish immigrant great grandfather first settled in Iowa before setting roots in Wyoming. I stopped for the night in Davenport Iowa. And at 11:30pm central time it was still 94 degrees with 88% humidity. Talk about UGH! I listened to the audiobook Venetia by Georgette Heyer. And then I started singing loudly along with music the last 3 hours. It is nice to be alone in the car sometimes. I notice that I also talk to myself and say random comments when I see interesting road signs or for that matter, anything. I see this, I just have to say "bi-gosh"! Friday, I finished the journey to Illinois. I crossed the Mississippi. I took a moment, it is the farthest I have ever driven east. I made it to Naperville by 11:30am Friday. It was now time to be total dorks and catch up. I hadn’t seen Evil, Trek, and Noir for four years. We had met online in a fan forum back in 2007. Evil and I flew out to New York in 2008 to meet Noir face to face for the first time and go to NY Comic Con. We instantly recognised each other. This time we met a fellow fan forum friend FG for the first time. We all went out to dinner Friday night. Saturday we spent in downtown Chicago and did tourist stuff (double decker bus, water taxi, Navy Pier, Joffrey Ballet, Lake Michigan, the L). The architecture is amazing! Sunday we went to a Hindu temple. Gorgeous building! Understood nothing, but interesting. Had lunch and then it was time to take Noir to the airport. I leave for the next installment Monday morning to Minnesota. The time spent with the internet besties was great! We laughed our asses off! We always do when we get together. We all decided that it is time for them to visit me next time! A weekend isn’t long enough for us either, need more time. It went by so fast and felt like we didn’t really get a chance to just hang out and chat. Still, won’t pass up an opportunity, however short to see these guys. I regret missing the trip they did to Rome, Italy back in 2010. I just couldn’t swing it. Love my internet hotards! 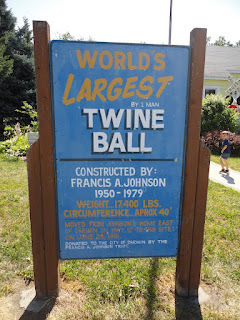 Stay tuned for next time where I visit the big ball of twine.... no really! In the beginning we were full of youthful exuberance and anticipation for our journey was finally beginning. We were going to Wyoming! ...in a car. However, once on the road it didn’t take long for that excited energy to turn to boredom and lethargy. We left Gilroy, the First-born, the Longboarder, and I, at 1:30pm Pacific Standard Time on Saturday the 30th of June. The First-born and Longboarder almost immediately went to sleep. I drove us over the Diablo range (Pacheco Pass), up the valley, and over the Sierra’s (Donner Pass) into Nevada. Drove past the biggest Little City (Reno), and watched the sun set behind the mountains north west of Winnemucca. I made it all the way to Wells, Nevada, before I needed to switch with the First-born. It was a little after 10 pm. The First-born drove the rest of the way to Cheyenne with a few stops along the way for gas and bathroom breaks. We arrived in the driveway of our Aunt’s by 10:15 am Sunday, Mountain Time. I awoke in Wyoming to smoke filled skies. We thought from the fires in Colorado, but we’re informed later that it was from fires in Wyoming. Cheyenne and probably all of Wyoming and Colorado have smoke filled skies. It smells of smoke. All the talk and news is about fires. Colorado’s new name is Crispy Colorado. Driving in a car for 20 hours is like being on a long flight overseas. Only the bathroom is bigger and you can get out of your seat and get fresh air and don’t have to listen to crying babies or annoying drunk passengers or plane changes. Oh and TSA. Not sure which is worse, 20 hours in a car or plane? I think it is a toss up. We tried three audio books. First one was lame. Well, could have been cool if we were 12. So only listened to the first disc. Second was was pretty good. Would have been funnier if I was British. The third was a hit. We are still listening to it and every time Longboarder and I would wake up, we would have First-born tell us what we had missed in the story. Longboarders first comment once we arrived in the driveway of Aunt P’s house was, “Get me out of this car!” Thinking that everyone was still at church, I texted my cousin D and asked her what the door code was for Aunt P’s house so we could use the bathroom. She texted back the code and to the front door we went. First-born said, “we should see if she is home first”, and proceeded to knock. Aunt P opened the door. She said that she had been texting cousin D and cousin D had texted that we were there. Aunt P texted back saying that no we weren’t. Cousin D texted back, “they are in your driveway!” And sure enough we were. We relaxed and washed up, unpacked, and discussed where we would be sleeping. Me, upstairs in the spare room (cousin D’s old room), and First-born and Longboarder in the basement rooms. I washed my face, brushed my teeth, and put flip-flops on and we were ready to go to Grandma’s. We had lunch there of KFC. Longboarder said, “finally, real food”! We had packed our pantry and fridge for the trip. We didn’t stop for food, drinks, or snacks. We had PB&J sandwiches, nuts, doughnuts, water, kool-aid, and other various what-nots from home. Various relatives started to show up, Aunt J, Cousin D and her hubby and two girls (Miss Princess and Miss leave me alone), Uncle E, Cousin T and his better half and their kids (Young cowboy and cowgirl), Uncle E’s sister and hubby, and Cousin T’s better half’s parents. All were there to celebrate Miss Princess’ 3rd birthday. Miss Princess got a lot of new Princess clothes. She also got her first bicycle. We played candyland with her on the table we had made for her. First-born, Longboarder, and I were walking zombies, only we didn’t eat anyone’s face off. Miss leave me alone is about ready to walk. She is around 10 months old. She doesn’t like me yet, or maybe she was just tired and crabby. I’ll go with tired and crabby, and not the fact that she has never seen me before. We explored the bunk house and basement at Grandma’s and chatted with everyone. We went back to Aunt P’s for bed, and I had my first poop in over 24 hours. First-born left her mark in every state. We will sleep good tonight. I hope so anyway because I have kankles!